Experienced cosmetic dentists, Drs. Lawrence Addleson, R. Douglas Campbell, and David Landau, now welcome patients in and around El Cajon, CA, for dental crowns, with or without a referral. The Art of Dentistry offers personalized, quality cosmetic dentistry services using advanced dental technology like CEREC same-day dental crowns and trusted cosmetic dentistry expertise. Today, CEREC technology allows patients to receive a brand new tooth in a single visit, without any temporaries, multiple office visits, or time-consuming alterations. The Art of Dentistry now invites patients in need of dental crowns in El Cajon, CA, to experience CEREC same-day crowns technology, with or without a referral. The cosmetic dentist team includes Drs. 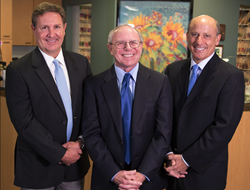 Lawrence Addleson, R. Douglas Campbell, and David Landau, who bring combined general, dental implant, and cosmetic dentistry services to their San Diego, CA, location. The team prides themselves in offering quality, personalized, and highly detailed care in a modern setting that incorporates many advanced dental technologies like CEREC. Dental crowns hold many purposes, both cosmetic and functional. Teeth that are badly decayed, cracked, broken, or have had a very large filling or root canal therapy benefit from the functional improvements crowns provide. Patients with missing teeth also benefit from strong, aesthetic dental crowns that complete a dental implant or dental bridge. Traditionally, the process for receiving crowns required multiple visits to the cosmetic dentist to receive an impression, fit a temporary, and finally fit the final restoration. If the dental crown did not fit correctly, they were returned to the dental lab to be modified. Today, CEREC technology allows patients to receive a brand new tooth in a single visit, without any temporaries, multiple office visits, or time-consuming alterations. CEREC technology offers patients more than the convenience of a same-day restoration. Dental crowns created from CEREC technology begin with a digital impression that eliminates the need for messy pastes. The high-quality software ensures a more natural-looking, durable dental crown and more precise and snug fit over the tooth. Crowns are milled in-house, with no dental lab work required, allowing the doctor to make alterations chairside and restore the tooth at the same appointment. As a whole, the CEREC treatment process is non-invasive, convenient, cost-effective, and high quality. “Computing power is so much faster and more powerful, and there has been such an advance in dental materials that we can now fabricate beautiful and strong crowns in one dental visit using the CEREC process,” says Dr. Campbell. Patients needing a new cosmetic dentist can turn to The Art of Dentistry for quality, personalized care. Patients located in and around El Cajon, CA, needing dental crowns can call the practice at 619-291-4325 or visit http://www.sandiegoartofdentistry.com to schedule a consultation. Art of Dentistry is a cosmetic dental practice offering patients customized dental care in San Diego, CA. Applying a philosophy that considers the art, science and biology of a smile, Drs. Lawrence Addleson, R. Douglas Campbell and David Landau provide personalized care in a comfortable, family atmosphere. With combined experience of over 85 years, the Art of Dentistry team uses state-of-the-art technology and leading techniques to craft each healthy smile. To learn more about Drs. Addleson, Campbell and Landau or the services they offer, visit their website, http://www.sandiegoartofdentistry.com. To experience the Art of Dentistry difference, call 619-291-4325.